Cute Bermuda Shorts Outfits for Girls – The hot season still seems to be upon us, causing us to head towards the beach. Aside from casual Saturdays spent by the beach, there are many pool parties, picnics, weekend brunches and shopping trips to plan for. The perfect chic outfit for girls to wear outdoors are Bermuda shorts. These look good on women of all shapes and sizes and ages. Many people think Bermuda shorts are boring, however, they can be styled for a glamorous yet relaxed look. Check out the following suggestions for a super fun outfit to wear at events. Remember that they look best when paired with sandals. If you’re looking for a more sophisticated or professional look, opt for the tailored Bermudas, silk blouse, and blazer since they look dressy. For a funky beach look, pair your colorful Bermudas with a white shirt. If you want a slimming effect, go for Bermudasrmudas. If you want to add some extra length to your legs, wear them with heels or wedges. To avoid a baggy look, wear them with a well-fitted shirt or bodysuit. 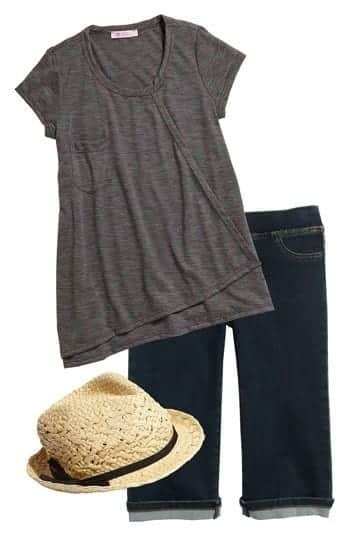 For a relaxed yet fun look, grab your loose t-shirt, an oversized hat, and denim Bermuda shorts. This attire is perfect for walking and looks great with leather sandals or Crocs. Looking to jazz up a black and white look? Simply add on bright colored Bermuda shorts, such as pastel pink, or any neon shorts. This works really well on young girls and especially school going teens. If you need the perfect semi-formal outfit for your job, wear straight-cut, cotton bermuda shorts. Paired with tan leather heels and a cropped blazer, you have the perfect outfit for a professional yet fashionable look. If you like such pastel colours, you will surely love these 18 cute pastel outfit combinations. For a sorority girl outfit, keep it fancy with a neon pink top and black polyester blend short pants. Mix it up with bling accessories and a Guess handbag. If you’re also a lover of pink then don’t miss these amazing Pink fashion accessories for girls. If you’re a plus size girl, then make your curves look fun with denim bermuda pants. Pair it with a off-shoulder white t-shirt, a glitzy gold belt and shiny metallic heels. Also take a look at these 16 cute outfits to wear with gladiator heels or sandals this season. Heading for a trip towards the sea or river? Wear a stripy outfit and pair it with a brightly coloured blazer. Keep the bottoms plain and white to draw attention towards your blazer. Pumps shoes would look awesome with this look. For a whimsical outfit for little girls, grab your polka dot sweater and mix it with a striped shirt and a bow tie. Pair this with khaki bermuda trousers and dark leather pumps. Heading out on a date? Go cute with folded up black bermudas and a matching zig-zag print chiffon blouse. Mix it with matching black shoes. A look that is great for fun by the beach is a brightly coloured red bermuda short. Mix it with a denim jacket and a tucked-in striped shirt. An oversized tote and sneakers can be worn for a practical look. Going to class? Pop on pale blue bermuda pants with an oversized black blazer. For a fun, retro look, tuck in the front of your shirt and wear wedge heels. For a punk rock look, wear a black t-shirt and pair it with plain black bermudas. The t-shirt can have grunge art or a metal rock band printed on it for a funky look. If you’re the kind of girl who just can’t go with simple outfits and always want to make a statement then you need to focus on the details. You can easily find such cool bow-tie Bermudas or other details that will make you stand out. If you can’t find one, why not make one? You can easily turn your ordinary shirts into unique ones with some DIY tutorials. A hot casual look that’s ideal for the weekend brunch when you want to look good while making it seem effortless. A simple but funky look, you would also like these cool Ideas on How to Wear Hot Pink Skirts. Floral Bermuda shorts look great in Spring and Summer season, especially when worn in pastel shades. They’re so cute and girly and look great when paired with either plain solid colored tops or striped ones. This is a look that even celebs can’t resist, as you can see how dope it looks on Rihanna! We’re absolutely loving the fresh Carribean and tropical vibes she is giving off. If you’re a curvy girl who loves to embrace her curves then Bermuda shorts are what you need. Some of the best options for you would be pleated shorts or ones with embellishments at their base. For the most flattering look, go for wide legged and knee-length Bermudas and pair them with a nice fitted top. Looking for a cool and comfy outfit to wear at home? Wear your Bermuda shorts with a tank top and your favorite shoes. Also, have a look at Girls Summer Home Wear. For a rough and rugged look, wear your ripped Bermudas with a white off-shoulder top. It’s also an ideal street style look. Bermudas are perfect for busy mummies since they let them stay comfortable and functional as they carry on with their mom duties or work responsibilities.